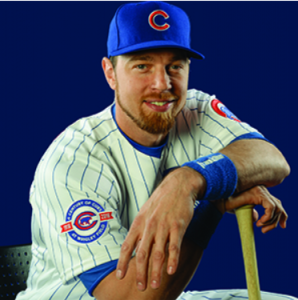 Ben Zobrist of the Chicago Cubs gets “it.” I cannot explain what “it” is but I believe I know it when I see it. On the World Series championship team in 2016, he was the Most Valuable Player of the Series. This is an extraordinary honor for any major league player. He did an equally as extraordinary thing this past Saturday. I was at a north-side Chicago park district baseball park watching my nine-year-old grandson play in a Little League game that morning. He was playing on one diamond and another game was being played on an adjacent diamond. All of a sudden the game on the other diamond stopped and we all wondered why. The players and the adults at the game gathered around someone. That someone was Ben Zobrist in his Cubs uniform. The Cubs had a game that afternoon at 2 p.m., so Zobrist, who lives in the neighborhood, rode his bike over to the park to watch the kids play. I walked over to the diamond to see if I might be able to shake his hand, congratulate him on a great career, and let him know that I had coached at the University of St. Francis. He played his collegiate baseball in our Chicagoland Collegiate Athletic Conference. We had a great rivalry and a great relationship with his University, Olivet Nazarene, and we were all were very happy to see a player from our conference have such great success at the highest level of baseball. You can imagine the glee on the faces of the young players! They brought balls, bats, and hats to one of their heroes to get his autograph. The adults followed suit. It was great to see a World Series MVP ride his bike to a neighborhood park on game-day to meet the young athletes and their parents and friends. Just being there showed that Zobrist gets “it.” Then he took it to the next level. At each diamond he stayed until every boy and adult got his autograph and a picture with him. He could not have been more accommodating, humble, and gracious. I thought he also showed how much he gets ”it” when I overheard his comment to an older umpire. I would think this umpire was being paid very minimally but he was there in ninety degree heat to serve the kids. Zobrist sincerely thanked him for what he was doing for the kids and for baseball’s future. Not unlike ball players, leaders are often held in high esteem. Unfortunately, I have seen leaders and ball players act with arrogance and superiority when meeting others.